Univentricular congenital heart diseases include a range of pathologies that result in a functionally single ventricular chamber. The most common pathologies in this group are tricuspid atresia, pulmonary atresia with an intact ventricular septum, hypoplastic left heart syndrome, and a double-inlet ventricle. Although the only curative therapy for these patients is cardiac transplantation, there are several palliative surgical techniques that divert part or all the systemic venous circulation into the pulmonary arteries bypassing the single ventricular chamber. The modern Fontan procedure consists in anastomosing both SVC and IVC to the right pulmonary artery; it is nowadays the last step of single ventricle palliation. 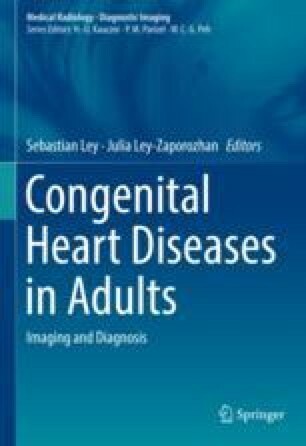 The importance of imaging in these pathologies lies not only in the understanding of the new circuit established after surgical correction, but also in the early detection of the wide spectrum of cardiac and extracardiac complications that can happen due to the new physiological condition. Due to the increased survival of these patients, long-term complications are becoming more common. Imaging patients with single ventricle physiology and particularly following single ventricle palliative procedures is challenging due to the altered anatomy and hemodynamics. While MRI and MRA should be considered the modality of choice due to the inherent lack of ionizing radiation in this patient population, CT angiography is an important alternative noninvasive imaging technique. In this chapter, we review the different palliative surgical techniques in patients with univentricular heart diseases, and we describe the optimal imaging protocol and the expected surgical anatomy as well as the long-term complications. The online version of this chapter (doi: 10.1007/174_2017_109) contains supplementary material, which is available to authorized users.